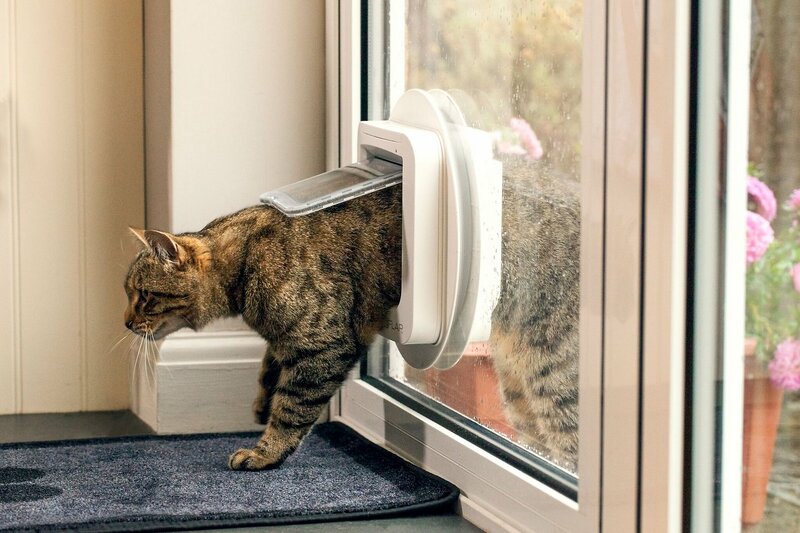 Give your kitty a safe way to get inside while keeping unwanted guests out with the SureFlap Microchip Cat Door. 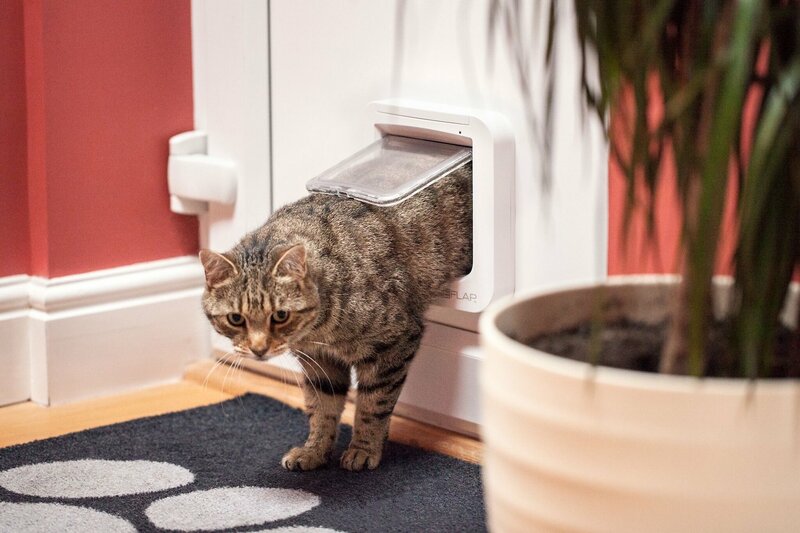 Just like giving your cat their own house key, this flap door is smart enough to know who’s allowed in and who’s not. It works by picking up on your cat’s unique microchip or collar tag, and only opens to let your kitty in, while staying closed for all other animals. Simply program in your cat’s microchip with just one button―you can store up to 32 cats in the system―and install on any door, window or wall. It has no cumbersome cables, and features a manual 4-way lock that lets you control when your cat comes and goes, even a setting to keep him inside at night. The system is compatible with all microchips and RFID collar tags. Flap door knows your cat’s unique microchip or collar tag id and only opens for your kitty. Flap stays locked for any other animal, keeping unwanted cats and other uninvited guests out. Easy to program with just one button and can remember up to 32 different cats; compatible with all microchips or RFID collar tags. Features a 4-way manual lock to control when your cat comes and goes, or keep him inside when you want. Easy to install on any door, window, or wall with no cumbersome cables; batteries not included. Main Flap Assembly, Battery Compartment, Memory Button, Indicator Lamp, Catch, 4-way Manual Lock, External Frame, Battery Cover, Selection of Screws, Screw Caps, Draught Excluder. SureFlap RFID Collar Tag sold separately. Use SureFlap Cat Door Mounting Adapter for installation in glass doors, windows, or walls. 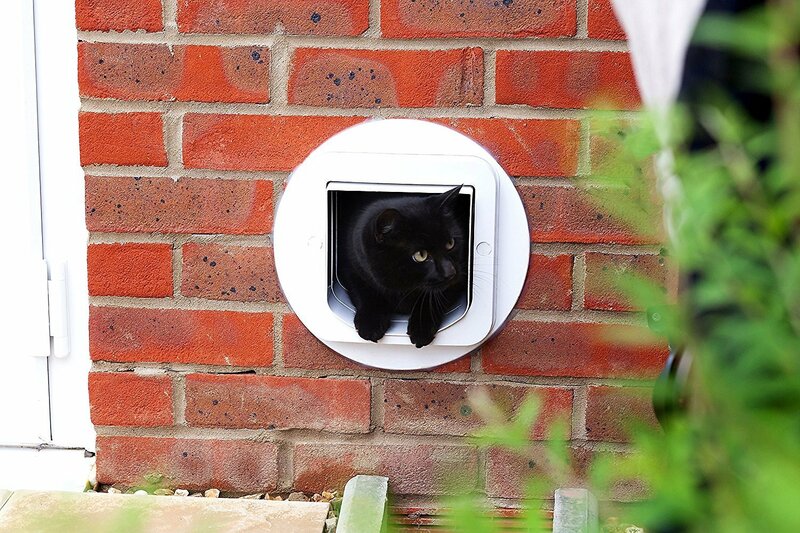 Also available: SureFlap Cat Door Tunnel Extender. The system is not reliable enough. After a few weeks, our cat can open the door from inside when the lock is on. He just pulls the door by the side; the lock is not tall enough and the door is too flexible, it takes him a few seconds. And besides, the door remains opened afterwards, letting any other animal come in! Also, keep in mind this cat door cannot be fixed on an exterior wall without buying another accessorial (unlike all our previous cat doors). Our cat is starting to get used to it. It certainly gives her more freedom and independence. We would have liked it even more if she didn't start bringing her "trophies" into our house. This was very simple to set up and install. A great idea, we're trying to keep cat A out of a litter box so cat B will use it. We installed on an interior closet door. Now, if we could only get her to use it!!! Cats. This cat door is great in theory. It took my cat a few days before he figured out how to push through, but I kept getting woken up at night to him smashing himself against it trying to get inside. I think his microchip is too far back on his shoulder to open it, so just ordered the tags. Hopefully that will be a better solution!